Public opinion of Oculus hasn't been very high lately thanks to its Facebook acquisition, but its not going down without a fight. Michael Abrash, formerly in charge of augmented and virtual reality at Valve, is now part of the Oculus team as chief scientist. Abrash is yet another veteran of the video game industry joining the maker of Oculus Rift, with the other being John Carmack. 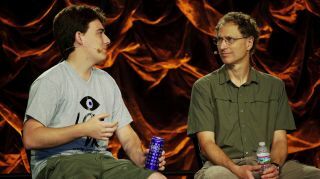 The two previously worked together on Quake, and Abrash wrote in the Oculus blog, "It's great to be working with John again after all these years, and with that comes a sense of deja vu." "It feels like it did when I went to Id, but on steroids - this time we're working on technology that will change not just computer gaming, but potentially how all of us interact with computers, information, and each other every day," Abrash wrote. The new chief scientist also isn't phased by Oculus's new owner. For Abrash, it all boils down to having the necessary funds because "fully tapping the potential of VR will take decades," and a lot of time means a lot of money. Now with Facebook on board as cash cow, Abrash feels as though "VR is going to happen in all its glory." Perhaps with his support and positive outlook, the vitriol on the 'net will die down a bit and people will begin to realize that it really is virtual reality's time to shine. What does Facebook's buy mean for the future of VR?